Designed to power all the gear in your kit, the Sherpa 100’s versatile array of ports include two ultra-fast, smart USBs for phones and tablets, a 12 Volt port for lights, an innovative port specifically for laptops, and a detachable AC inverter for DSLR cameras. The Sherpa 100 recharges from the wall, car and/or included Goal Zero Nomad 20 solar panel so you can power the Sherpa 100 from the sun. The most rugged, durable, weatherproof phone & tablet recharger on the market, no rubber plugs needed. 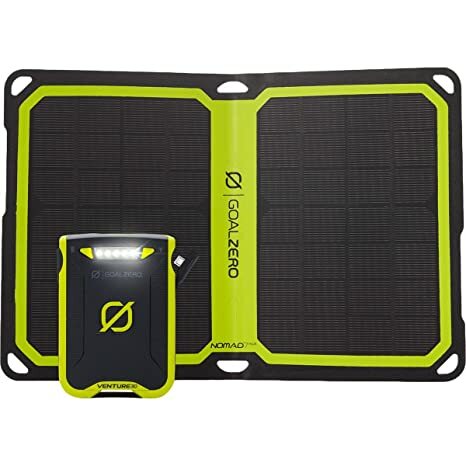 Charge up from USB or included nomad 7 plus solar panel. The venture 30 Pack the power you need to keep those small devices, cameras & tablets charged no matter the elements. With an Ipx6 weatherproof rating & 7800Mah battery capacity, the venture 30 will keep everything running smoothly. 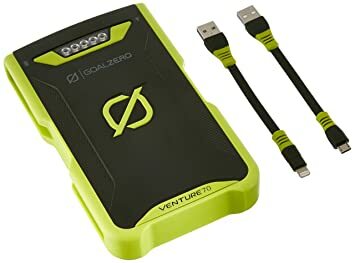 Goal Zero Yeti 150 Portable Power Station: A small, 168 watt-hour power bank for charging phones, tablets, small laptops, and other personal electronics devices. The Nomad 13 packs the perfect power source. Charge your handheld devices directly through the USB port or charge Goal Zero’s battery packs for later use. Durable and weather resistant to withstand the harshest of climates. 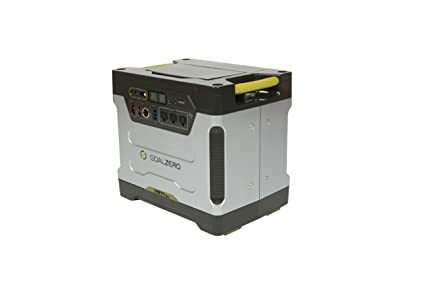 Quiet, portable power for base camps, cabins and unexpected outages. 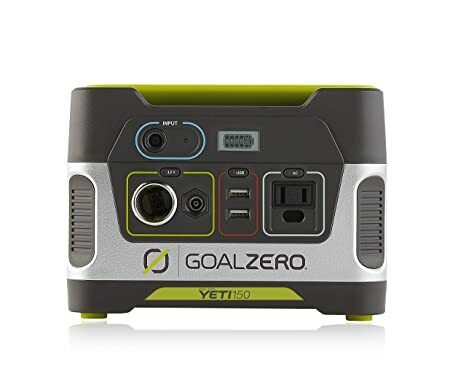 The Goal Zero Yeti 400 Portable Power Station allows you to live life off the grid, camp in luxury, or power through an outage without the noise and fumes of traditional back-up generators. Item is hazmat and non-returnable. 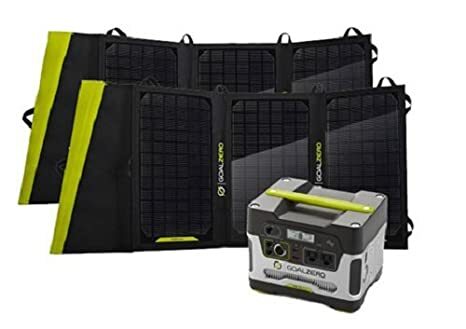 This kit comes with two Nomad 20 solar panels. The Venture 30 is more than just a battery, it’s a lifeline to adventure, a conduit for exploration. Use it to keep the moment alive, to push the limits of your creation, to keep the essential charged and ready for what happens next – no matter the weather. Phones, cameras, tablets, whatever else you need to follow your passion, keep it all going from one adventure to the next. 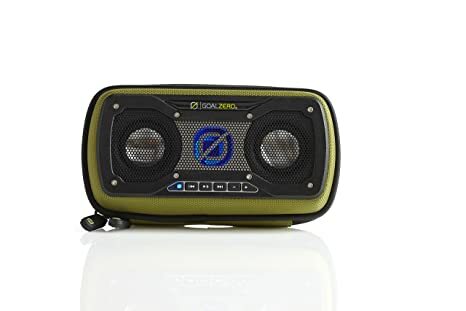 The Rock Out2 Solar Speaker boasts a weatherproof outer shell and is built on durable POM plastic for extreme stability. With a durable, weatherproof exterior that’s built to withstand the toughest elements Mother Nature can throw, the Rock Out 2 Solar Speaker proves its worth as an outdoor speaker, and serious protection for your gear. Its roomy inner fabric-lined compartment and heavy-duty zipper keeps phones and iPods inside while preventing water, dirt and grime from getting in. The Rock Out 2 Solar Speaker features an innovative DarkBass chamber that allows massive airflow for deep, precise sound without excess space. Its two 40 mm, 4W drivers deliver a full-range of precise sound for an unparalleled stereo experience, even when you’re far from home. When every ounce counts and size matters, the Rock Out 2 Solar Speaker ensures you’ll never have to sacrifice on quality sound. Some adventures require more sound than the competition can pump out. Unique to the Rock Out 2 Solar Speaker is its ability chain with other speakers, taking your music to a whole new level. With one-touch Bluetooth pairing, stereo streaming and a built-in waterproof microphone, you can easily connect your smartphone and seamlessly answer calls without interruptions. The Rock Out2 Solar Speaker is the perfect hands-free solution when you’re on any adventure. No cables. No hassle. NEW PRODUCT! The Venture 70 packs the power you need to keep those small devices, cameras and tablets charged no matter the elements you may be out battling. With an IPX67 weatherproof rating and 17,700mAh the Venture will keep everything running smoothly. 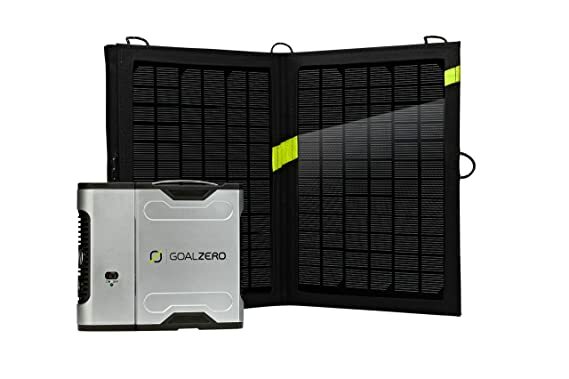 Goal Zero Boulder 100 Watt Solar Panel A highly efficient 100-watt monocrystalline solar panel designed to recharge Goal Zero Yeti Portable Power Stations. Features a 5ft cable to connect directly to Goal Zero products. Built for Portability and Durability Features a rigid, lightweight anodized aluminum frame and sturdy tempered glass; weatherproof construction makes it ideal for permanent or semi-permanent installation. Removable Kickstand A collapsible kickstand makes it easy to set up wherever you need it. Its also easily removable to make for easy installation. Optional Chainability Pair the Boulder 100 Solar Panel with Goal Zeros easy-to-use Combiner Cables to chain additional panels together and collect more power from the sun. US Based Solutions Center Team Our friendly customer service team is located onsite in at our headquarters in Utah. These power experts are knowledgeable and easy to reach by phone, email, or online chat. Power your laptop and tablet with Goal Zero’s Sherpa 50 Solar Recharging Kit. Easy to pack, light to carry and expandable to fit your charging needs. Charge lithium battery from wall, car, or sun. Includes a 110 Volt bolt-on inverter. All your climbing friends ask to charge their phones from your Goal Zero battery the moment everyone gets back from camp. You’d rather they didn’t take a billion climbing photos every time they go to the crag, but the Boulder 50 Solar Panel powers your battery while you’re away, so there’s no real harm. State-of-the-art monocrystalline technology in Boulder panels deliver more power per square inch than any other solar technology available, and Goal Zero wrapped it up in a rugged, durable, rigid, waterproof, and impact-resistant housing for protection from the elements. 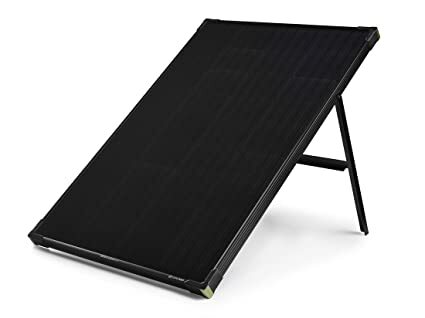 The Nomad 20 Solar Panel combines highly efficient mono-crystalline technology in a foldable, portable, plug-and-play form. With a built-in junction box and innovative smart chip, the Nomad 20 can directly charge handheld USB and 12 Volt devices directly from the sun, just as fast as the wall. Combine the Nomad 20 Solar Panel with any of Goal Zero’s power packs and store power to charge your gear day or night. 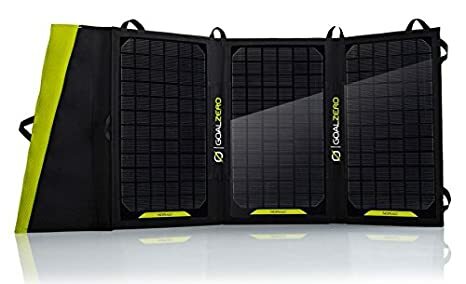 Goal Zero Boulder 100 Watt Solar Panel Briefcase A highly efficient portable solar panel totaling 100 watts, in an easy-to-carry briefcase form. Features a 5 foot cable to connect directly to Goal Zero products. Built for Portability and Durability Features a rigid, lightweight aluminum frame and sturdy tempered glass. Includes a built-in handle for easy carrying. 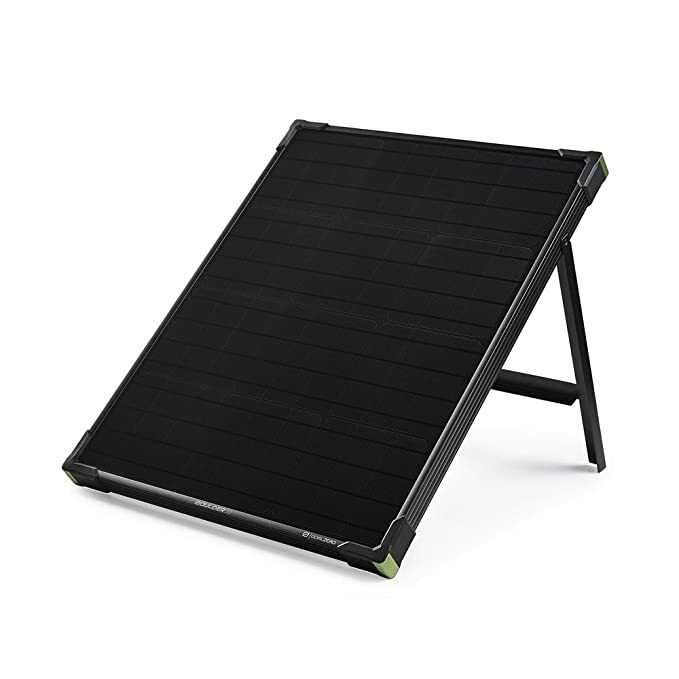 Removable Kickstands Collapsible kickstand makes it easy to set up wherever you need it and helps optimize solar angle. 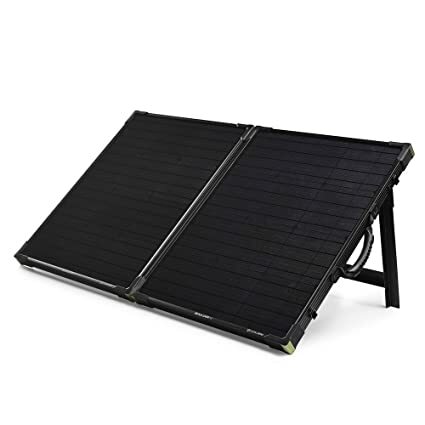 Optional Chainability Pair the Boulder 100 Solar Panel Briefcase with Goal Zeros easy to use Combiner Cables to chain additional panels together and collect more power from the sun. 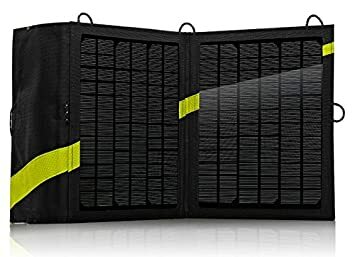 Canvas Carrying Case Included Protect your solar panel during travel or storage with the included canvas carrying case. US Based Solutions Center Team Our friendly customer service team is located onsite in at our headquarters in Utah. These power experts are knowledgeable and easy to reach by phone, email, or online chat.